ABB has announced that it has won a $55 million deal to supply a submarine AC power cable system for the 400MW Dudgeon offshore wind farm by Statoil and Statkraft that will feature 67 Siemens turbines in waters 18 to 25 meters deep some 32km off the seaside town of Cromer on the Norfolk coast. According to the press release issued by ABB, the Dudgeon Offshore Wind Farm will be capable of producing enough electricity to power more than 400,000 UK homes annually. “Offshore wind is a growing renewable energy resource, with Europe accounting for around 70 percent of new offshore wind generation capacity. Transporting electricity from offshore wind farms to the shore and then integrating it into the grid for supply to consumers are key elements. This is a key focus area for ABB as we strive to balance the growing need for electricity while minimising environmental impact. Our technological strengths, vast portfolio and rich experience in this area position us well to execute this project and we are delighted to have this opportunity,” said Claudio Facchin, Head of ABB’s Power Systems division. “The submarine export cable connection is a long-lead item and placing this contract represents a major milestone in the development of the Dudgeon project. These cables will be some of the longest offshore cables ordered so far for a UK offshore wind project, and we look forward to working with ABB,” said Bjørn Ivar Bergemo, Asset Manager of the Dudgeon Offshore Wind Farm. 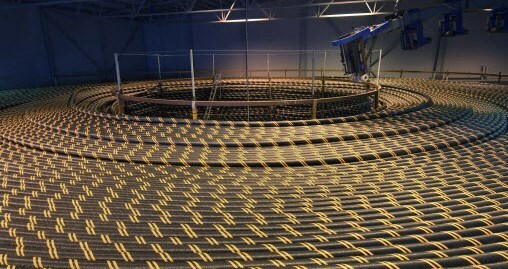 ABB will design and supply two 132-kilovolt (kV) three-core AC submarine cables, each 42 km in length, running from the wind farm’s offshore substation to Weybourne Hope, where they will connect to the onshore cables. The wind farm will produce enough “green” energy to displace emissions of carbon dioxide by up to 19 million tonnes over its 25-year lifetime. The two Norwegian companies, Statoil and Statkraft, acquired the Dudgeon Offshore Wind Farm project in October 2012 through the acquisition of all the shares in Dudgeon Offshore Wind Limited, a subsidiary of the UK energy company Warwick Energy Limited. Abu Dhabi’s renewable energy company, Masdar, invested in the company through share acquisition in August 2014. Today, Statoil owns 35%, Masdar 35% and Statkraft 30%. Next articleIs Ford contemplating early Australia exit?